Mathematical and statistical tools are becoming an increasingly important asset in ecologists’ toolbox. Nowadays it is quite rare that one encounters a paper published in ecology that does not involve any form of mathematical modeling or statistical analysis. On the other hand, the already overwhelming variety of available tools still keeps growing. As such, it is essential that adequate tools are chosen and properly implemented so that valid inferences can be drawn. In recent years a debate has been raised regarding the proper methodology to analyze power law relationships in the form of y = ax^b, which is one of the most widely observed patterns in biology. My collaborators (Ethan White, Mevin Hooten, and Susan Durham) and I conducted a study to compare the two methods most commonly applied to power-laws – linear regression on log-transformed data, versus nonlinear regression on untransformed data. We showed that the choice of the appropriate method depends critically on the distribution of error. 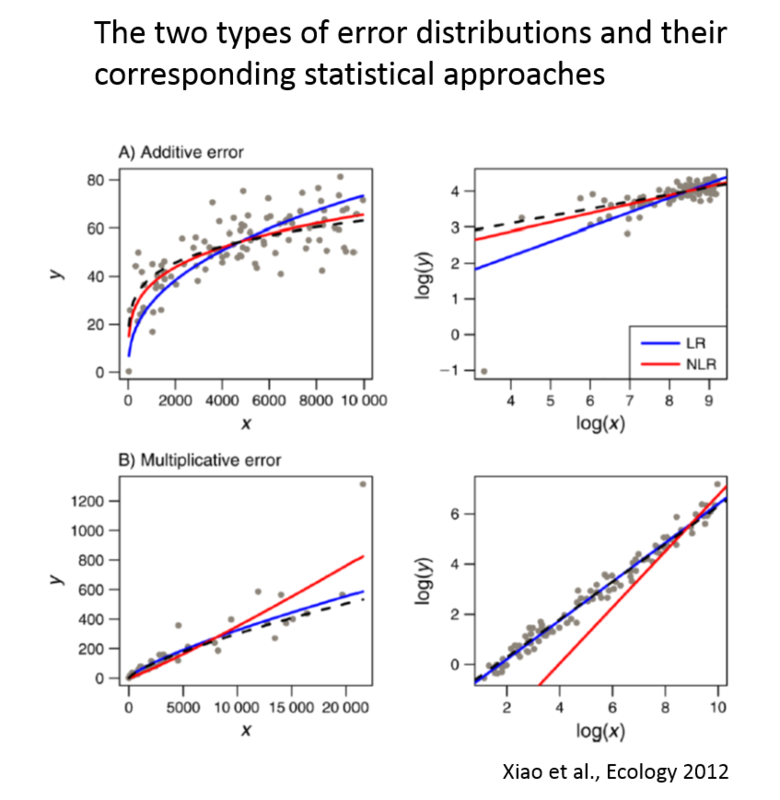 In the vast majority of the biological allometric datasets, the error distribution is closer to being multiplicative and log-normal than additive and normal, justifying log-transformation of the data. This work is published in Ecology (DOI: 10.1890/11-0538.1). While none of my current research projects focus specifically on the evaluation and development of methodology in ecology, this is a field that I hope to continue contributing to in the future.